A few weeks ago, we had our second annual Mom Camp week. (What is Mom Camp, you might be asking? Click here to read my blog explaining it.) Becca and three of her friends had an awesome week rotating among each other's homes to do games, gardening and craft projects, singing, dancing, cooking, and have good old-fashioned fun together! This year, with one year under their belts, the girls were excited to help plan more of the activities themselves. It was fun to see the variety of creating things they planned for their friends. As the week approached, Becca's mind was churning with ideas. 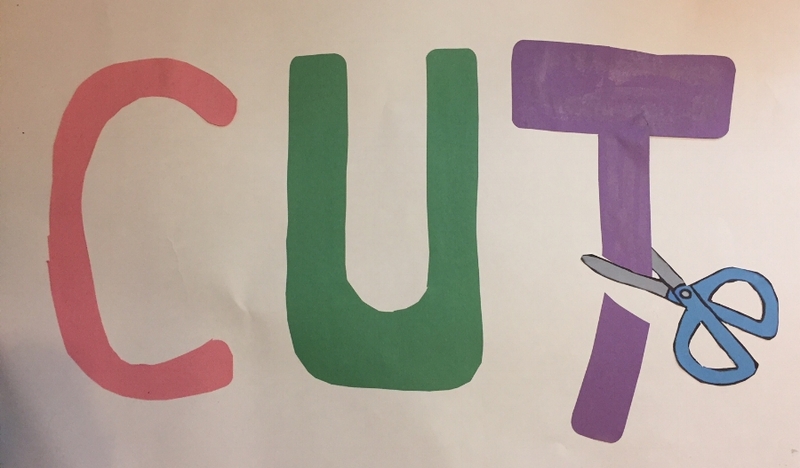 She loves crafts, and enjoys watching the cooking show Chopped on TV, so she came up with her own competitive crafting game, which she named Cut. She created the logo herself and made it on a poster board. I was very impressed! Becca designed and created the logo on poster board! Next, we gathered supplies and she thought up the rules. 1. There are 4 round of play. For each round, the crafters are presented with 10 random items, such as wire coat hanger, ping pong ball, empty oatmeal container, egg carton, shoelace, sheets of newspaper, etc. Each girl picked one item, and each was able to pick first for one of the rounds. 2. Crafters then have 10 minutes (which usually ended up as about 15 minutes) to make a craft using the their chosen object, using the various provided typical craft supplies--pompoms. construction paper, popsicle sticks, string, pipe cleaners, scissors, glue, markers, hot glue, etc. 3. For the first round, it was straight crafting. For the second round, about 2 minutes in, we threw in a twist--they each had to pick one additional item to incorporate into their craft. We were also thinking of mixing things up by having the girls select the item for another girl, or picking their item then making them pass it to the next girl, but they seemed so excited with their items I didn't want to upset the creativity. The girls busy on their creations! 4. At the end of each round, each crafter explains her craft and what inspired her to create it. 5. Then each girl secretly votes for first, second, and third place. They are not allowed to vote for themselves. The votes are added up (by me, Mom)--3 points for first, 2 points for second, 1 point for third place--and one winner is announced for each round. No one is eliminated. All points from each round are added together to get the overall winner at the end. The girls had a blast and were SOOO creative! I loved seeing them help each other out, bouncing ideas off each other, holding the craft pieces while their friends hot glued them, and complimenting each others projects. I think I see several rounds on Cut being played during future play dates!